We recommend installing Magento automatically using our 1-click install solution. Follow this guide: here. In order to achieve optimal performance for Magento webshops, we recommend that you use our Enterprise web hosting which has ultra-fast LiteMage Full Page Cache that will ensure extremely fast web pages. 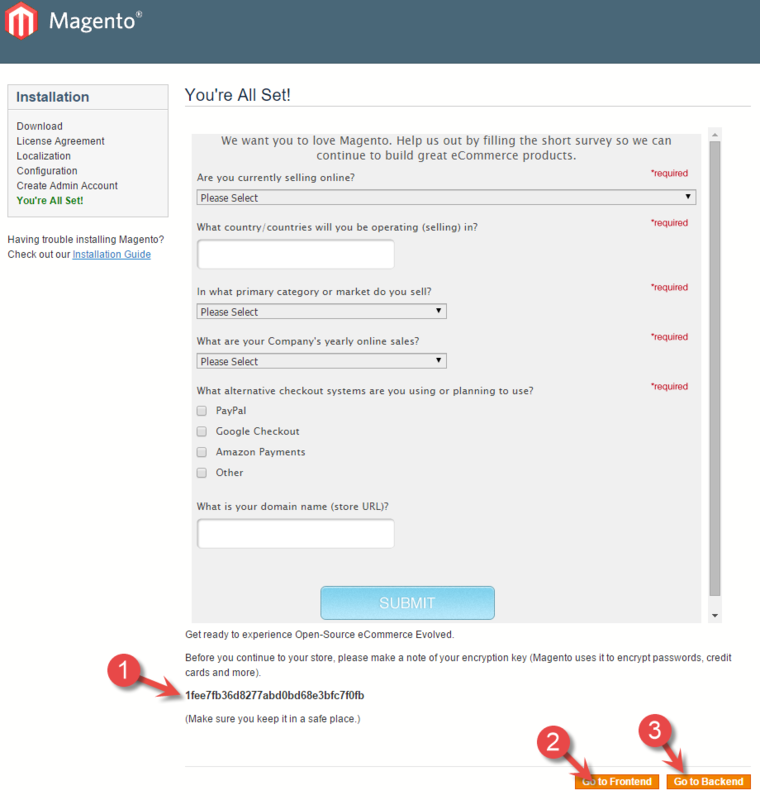 This guide explains how to install the Magento webshop on our web hosting accounts. Go to the Magento website on https://magento.com and download the latest full version of Magento (Magento Community version). You can pick between different file formats when downloading. Choose the one you prefer. If you do not have any preferences, you should select .zip, as this will generally pose less challenges. 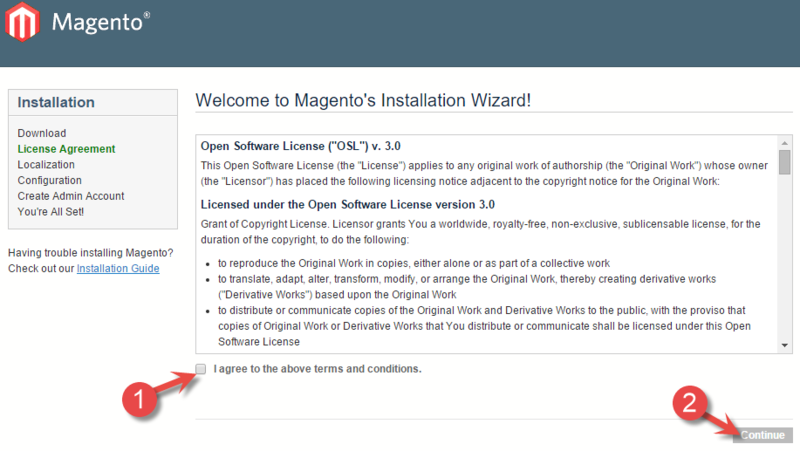 The file that you downloaded is an archive that contains the entire Magento installation. Unzip this locally on the machine you are using. In order to use Magento, you need a database. 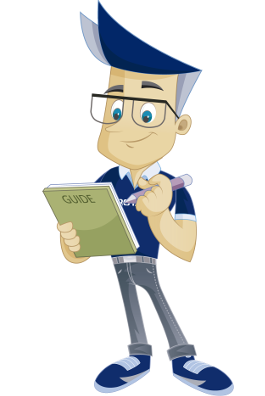 Follow the guide: Creation of MySQL database in cPanel in order to create the database with its associated database user. During the creation we refer to "magento" as the database name and "bruker1" as the database user in this guide. This gives a database name and a database user name as mentioned at the top of this guide (all database names and database user names will have the web hosting account user name as a prefix). 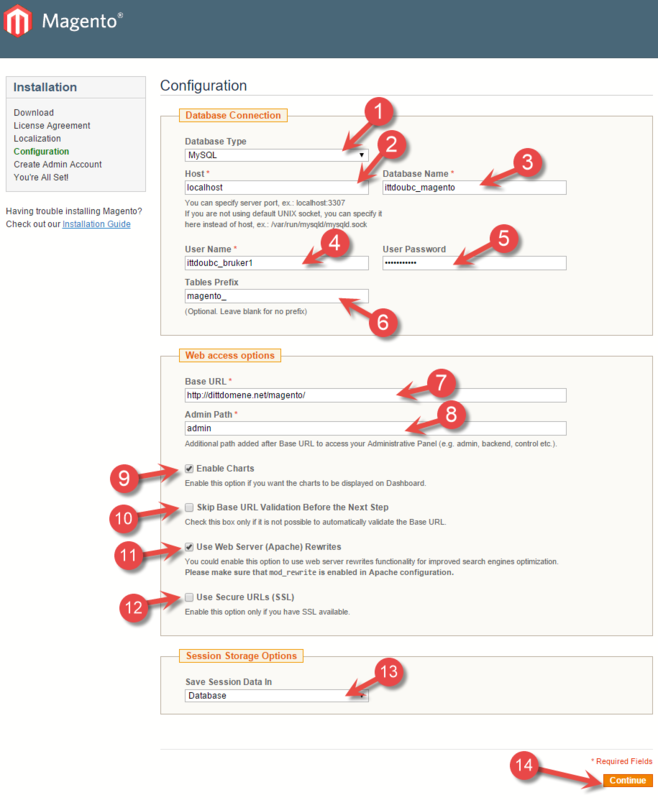 Magento can be uploaded in several different ways. This guide employs the simplest method - via FTP. If you are unsure of how to set up an FTP client, you should visit the guide for this in the guide section of our website. 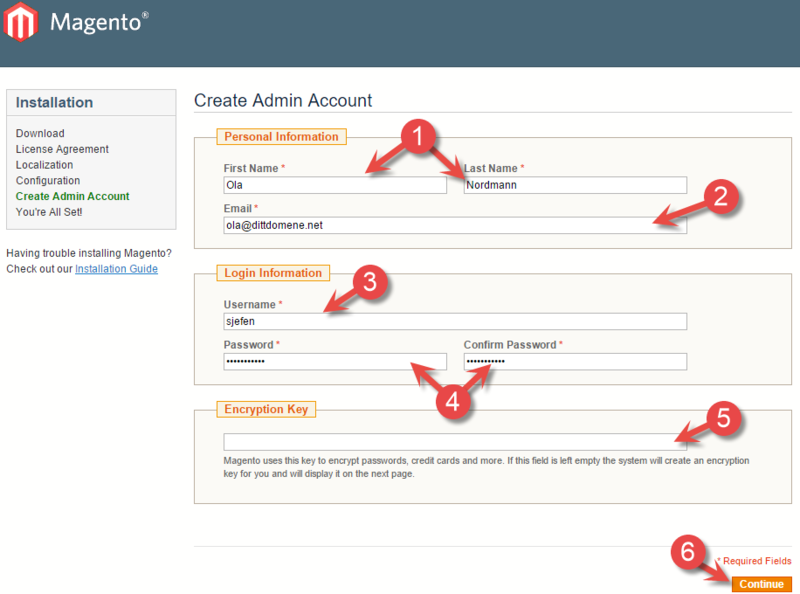 In our example, we will be installing Magento on the address: http://dittdomene.net/magento. When logging in via FTP, you will go to the public_html/magento folder. Files placed in the public_html/magento folder vil be made available on the address: http://dittdomene.net/magento. If you cannot find the public_html folder, most likely you have specified for your FTP client to start in this folder. Upload all of the files and folders from the magento folder on your local machine to the web hosting account. Beware that it may take some time, as a lot of files need to be uploaded. Visit the http://dittdomene.net/magento address in your web browser. Automatically, you will be shown the first installation page. Select the desired language ("Locale"). In our example, we select "norsk bokmål (Norge)". Select the time zone. In our example, we select "W. Europe Standard Time (Europe/Berlin)". Select the default currency. In our example, we choose "norske kroner". Specify the type of database used. On our servers, MySQL is the usual choice. Choose "localhost" as "host". This specifies that the database is located on the same server as the installation. Specify the database name under "Database Name". This must correspond to the database created in "Step 3". Specify the user that accesses the database, as created in "Step 3". Specify the password for the user created in "Step 3". Specify the desired database prefix. You can choose to leave this blank, Magento will then take care of this by itself. In this case we selected "magento_". Type in the desired user name of the main user on the new installation. Tick "Enable charts" in order to have diagrams directly on the "Dasboard" of the installation. This can be changed later. Do not tick "Skip base URL verification before next step". Tick "Use web server (Apache) rewrites". If you are using SSL with your installation, you must tick here. Having an SSL certificate for the domain is a prerequisite for this. Choose where to store the session data. We will select "Database". Type in your name and surname. Specify the email address you wish to link to the installation. This will be used in case of forgotten passwords and the like. Specify the desired user name of the installation administrator account. Type in the desired password for the user twice. Specify the "Encryption Key" if needed. This will be used for encryption data related to the website. In our case, we will leave it empty, so Magento vil create the key for us. Click "Continue" in order to complete the installation. The installation is now complete. If everything went well, no error messages will be shown. If you did not specify any encryption key on the previous page, you should save the key in a safe place before proceeding to the webshop or the administrator pages. Click here to go to the administrator pages.